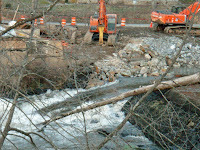 Duke Power has been trying to remove its dam at Dillsboro for several years, but the town has been fighting the removal. The fight is over, as this photo by our roving reporter Robert Sullivan of Creekwood Resort shows. The dam was part of a small 225 kW hydroelectric facility - the smallest of all of Duke's hydro plants. Duke obtained permission from FERC and financial assistance from the state of North Carolina for removal of the dam. Removal of the dam will eliminate a 14-acre impoundment and create a 10-mile unimpeded river flow. Odds are that smallmouth bass from below will move upstream, and trout from above will move downstream. We say fish it often and report on the results so we can all see what effect the dam removal has on the fishery!